"A Sweet Mitzvah to Sweeten Someone’s Day"
For months leading up to his Bar Mitzvah, Layne Kirshon was busy studying his Torah portion and preparing the Dvar Torah, along with a host of other Bar Mitzvah preparations. But Layne knew that among all the preparations for Mitzvahs that would benefit himself spiritually, he wanted to do Mitzvahs that would help other people as well. "I heard about the work that Aishel House does to help patients at Texas Medical Center, and I had wanted to do a mitzvah project, so I contacted Mrs. (Rochel) Lazaroff and asked how I can help out". In no time, he was rolling up his sleeves, donning an apron and baking honey cakes to be delivered to patients at the Texas Medical Center in honor of Rosh Hashana. 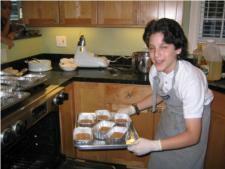 "To me it was an opportunity to sweeten someone’s day with a sweet mitzvah". In honor of her Bat Mitzah, Ellen Farber and her mother Susan, would come every Friday to pickup up hot meals to be delivered to the hospital. "My mom told me about it, and I thought it would be a fun thing to do – to help people," says Ellen. "It made me feel really good about myself and I think the people were really thankful." Those "Shabbat Packages" she delivered were most certainly appreciated. "It was a pleasure to see Ellen, with her kind demeanor and optimistic smile. When she would deliver the meals, she would literally bring joy with her into the room." Said Simone, the wife of a melanoma patient from New York. 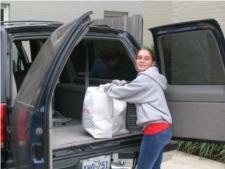 How has her volunteering impacted her Bat Mitzvah? Says Ellen, "I feel it made my whole Bat Mitzvah experience more enriching." Layne says he would tell other kids his age, "It really is a good feeling when you help other people." "It inspires me to see young people at a joyous time in their lives, reaching out with concern for another. Wanting to do something to make someone else’s day, just a bit better." Says Rochel Lazaroff, the volunteer coordinator at Aishel House. "I have no doubt that this collective good will go far to make our world a better place". Aishel House, a project of Chabad at Texas Medical Center, seeks to provide patients and their families at Texas Medical Centerwith a full range of support. 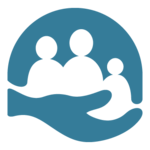 From basic needs such as transportation and delicious home cooked kosher meals to comfortable accommodations, child care assistance and sensitive counseling, Aishel House reaches out and offers a supporting hand to all, to assist them in their fight and recovery from their difficult illness. If you are interested in volunteering, or if you would like to help by sponsoring meals or apartments, please contact: Aishel House, c/o Chabad at TexasMedicalCenter, 1955 University Blvd, Houston, TX77030. Phone: 713-522-2004 or email info@aishelhouse.org.